The fast-paced world of pipeline politics, as it turns out, doesn't take time to dwell on sentiment. Keystone XL's rejection means prospects for Energy East have never looked brighter. Before U.S. President Barack Obama was even finished putting the spike in one controversial Canadian pipeline project, attention was already turning to the chances that another would get built. 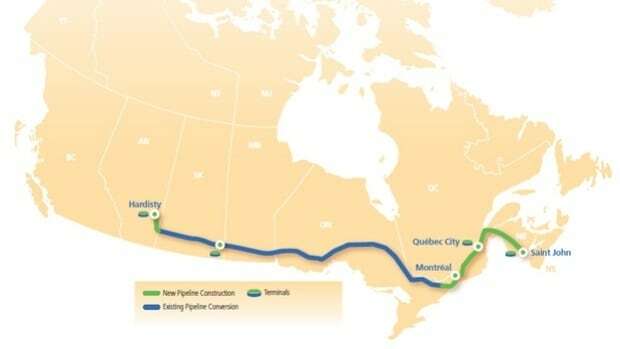 Due in no small part to Keystone XL's demise, the prospects for Energy East, a 4,600-kilometre length of pipe running between Alberta and New Brunswick, have never looked better. To call Energy East, now the presumptive front-runner among the remaining major pipeline projects, a lock to break ground would be, at the very least, wilfully shortsighted given the industry's losing battle for Keystone. That said, it also looks unlikely that Energy East will galvanize the same type of opposition that turned Keystone into an environmental lightning rod. Timing, as it's said, is everything. Despite running nearly the entire length of country, Energy East, which isn't the industry's first or best choice to move oil to a coast, may just turn into the path of least resistance. Ironically enough, Big Oil may also find that it's a pair of environmentally devout governments and a new national commitment to fighting climate change that helps put an end to its pipeline misadventures. "There's a lot of political goodwill towards seeing this pipeline get done," said Martin Pelletier, a fund manager at TriVest Wealth Counsel. "There are a lot fewer barriers and headwinds than for a Keystone, for example." The cocktail of factors that turned Keystone XL into the type of cause célébre the environmental movement had previously only dreamed about will be tough to replicate with Energy East. Unlike TransCanada's cross-border project, Energy East won't have to contend with the U.S. State Department nor will it be implicated in the grander environmental ambitions of the White House. As a wholly Canadian project, Energy East will, of course, need to satisfy domestic expectations. On that front, the project already has some influential friends. Justin Trudeau's new Liberal government, for one, is in Energy East's corner, as is Alberta Premier Rachel Notley and New Brunswick's Brian Gallant. Ontario and Quebec are another matter, but Energy East still appears to have the type of high-level political backing that Keystone XL lacked. In rejecting Keystone, the U.S. State Department cited the project's lack of economic benefits as part of its rationale. That argument would be tougher to make in Canada where a major new export pipeline is the top priority of an industry that contributes heavily to the country's economic health. "We put a 50 per cent probability on Energy East [getting built]," said Darryl McCoubry, an energy analyst at Veritas Investment Research. "It would be difficult to make an argument that, economically, it wouldn't be a benefit to Canadians." The picture for Energy East may be looking brighter, but that still doesn't mean the project won't be derailed. The new greenhouse gas emissions from the oilsands that the project will play a role in unlocking certainly won't sit well with the environmental movement. On that score, the upcoming climate change conference in Paris and the Liberal government's new level of commitment to tackling GHG emissions could actually help Energy East's chances. If new rules around carbon mean the oil industry is perceived to be a better actor when it comes to climate change, then the optics around a new pipeline become more palatable. Closer to the ground, the pipeline will also need to gain a level of social licence that's eluded two other major projects currently being considered: Enbridge's Northern Gateway and the expansion of Kinder Morgan's TransMountain line. "If the industry wants to get out ahead of a potential Keystone 2.0 they need to get the transparency and participation piece right," said Erin Flanagan, an analyst at the Pembina Institute, an environmental think-tank. "You're going to have a very active conversation in Canada over the next while about how the country is going to shore up its emissions and having that conversation while also talking about a number of different proposals that would expand emissions in the oilsands — there's a discontinuity there that I think you'll see people continue to point out." In determining whether a new pipeline is in the public interest, the role of the National Energy Board also needs to be considered. The regulator has been criticized in recent years for limiting the scope of its reviews of new pipeline projects as well as who can intervene. Early indications from the new Liberal government suggest they could be making good on a promise to give the regulator more bite. That would include, for instance, weighing the effects of so-called upstream emissions, the greenhouse gases associated with extracting fossil fuels, when considering new pipeline projects. Before Energy East sees the light of day it will also need to pass before the watchful eye of a Keystone-saturated Canadian public that boasts a new depth of understanding about pipeline issues, as well as a green lobby that's fresh off a landmark victory. "This isn't a conversation about choking off the industry," Flanagan said. "This is a conversation about really reeling in environmental impacts and making sure this is a sector that's responsible."